In a daring daylight robbery at a bank in Kohara eight armed assailants attacked three employees, injuring them and decamping with cash amounting to Rs 2.8 lakh this afternoon. Deepak, a nine-year-old tiger at the Tiger Safari Ludhiana, was adopted by Harbans Singh, a member of the management committee of Park Plaza, today. 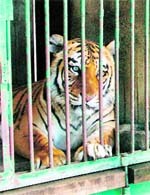 Having adopted Deepak under the animal adoption scheme started in the zoos of Punjab, Harbans Singh, in his capacity of a foster parent of the tiger, has given the first instalment of Rs 21,600 for Deepak’s food and shelter for three months. A large number of students of Class X at various government schools affiliated to the Punjab School Education Board across Khanna and adjoining Fatehgarh Sahib were taken aback after going through the question paper of computer science subject, as most of the questions were out of syllabus. One has come across many mobile vends and outlets - mobile ATMs, hospitals, eating joints among them. And now get ready for mobile liquor vends, thanks to the indifferent attitude of the district administration and the police and the supportive attitude of the excise department. The mortuary at the Civil Hospital here is not equipped to even accommodate 10 dead bodies coming for postmortem — on an average — to the hospital daily. Two of the four refrigerators are not operational at the morgue. 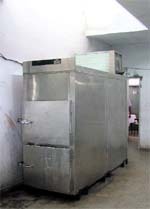 The refrigerators were donated by an NGO, but the department does not even have funds to get them repaired. In addition, the absence of forensic expert makes it more difficult as the postmortems are either conducted by the general surgeon or MBBS doctors who are not really skilled for the job. The purpose of identifying the actual cause of death through a postmortem stands defeated in the process. Constant increase in steel prices is working against micro small and medium enterprises (MSME). The Steel Authority of India (SAIL) has increased the prices of steel by Rs 2,500 per tonne while the Rashtriya Ispat Nigam has increased it by Rs 4,000 per tonne. The authorities at Punjab Agricultural University are in a fix to make the payment of salary to the teaching and the non-teaching staff of the university for March. The state government has not cleared the salary bill of Rs 8.42 crore for March. Rs 8.34 crore is the monthly salary bill and Rs 1.08 crore is the balance amount of Rs 4.34 crore as 20 per cent share of the state government in the enhanced pay scales of the teachers as recommended by the Central Pay Commission. Proud moments and cheerful smiles marked the felicitation ceremony of 31 meritorious girl students at Sanatan Vidya Mandir Senior Secondary School here last evening. 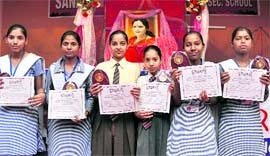 The girls, all from economically weaker section of the society, were felicitated for excellence in academics by the Punjab unit of Shakti, a project run by Anandmurti Gurumaa. Noted writers, poets and educationists from the city paid tributes to Dr Amrik Singh Pooni, a noted Punjabi poet and former chief secretary, Punjab, who died following a prolonged illness on Saturday evening. A colourful fancy dress competition was held at Ram Lal Bhasin Public School, Phase I, Dugri. Kids dressed up in attractive attires performed and delighted audience. Dressed up as models, actors, historical figures, politicians and teachers, the children mesmerised everyone. The highlight of the day, however, was a kid dressed up as Uddham Singh, who left all present spellbound with his performance and dialogues. School headmistress congratulated the winners and gave away the prizes. In an endeavour to treat chronically ill patients suffering from HIV/AIDS, the Punjab State AIDS Control Society (PSACS) will soon start a community care centre in the Red Cross laboratory on the Brown road, Ludhiana. A blood donation camp was organised at Sarvhitkari Vidya Mandir School by the Bharat Vikas Parishad. A total of 129 persons, including women, donated blood. Casual and Contract Workers Union of Bharat Sanchar Nigam Limited (BSNL) today sat on a hunger strike. Sukhchain Singh Channi, president, said nearly 150 telephone mechanics, 60 sweepers and 48 peons, computer operators, ac operators and sand mechanics were thrown out of their jobs on March 17. 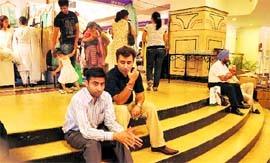 Fashion expo gives hubbies the shakes! The year’s much awaited fashion event, 'The Woman 2010', is an occasion that brings the city’s women great delight. However, many men dread the very thought of having to tag along to the show with their wives and, much before it begins, start looking for excuses to avoid the shopping sprees that their intend to go on during the exhibition. While many give ‘office’ and ‘important meeting’ as an excuse for not accompanying their women to the expo, there are others who feign illness at the last-minute. However, there are others who find themselves unable to evade the event, which is largely a ‘by the women, for the women and of the women’ affair. The amendment made in the Punjab Urban Rent Control Act by the state government to provide relief to the non-residents Indians (NRIs) are being misused to seek eviction of bonafide tenants to the extent that many properties are transferred in the name of NRIs just to get the rented portion vacated. Local MP and All India Congress Committee national spokesman Manish Tewari on Saturday lashed out at the Akali-BJP government in Punjab for “failing on all fronts, be it economy, finance, industry, power, law and order or procurement of farmers’ crops”. ICICI Bank has been awarded the best SME Banking Award for 2009 at the ninth Asian Banker Excellence in Retail Financial Services Awards Programme. ICICI Bank emerged as the winner among over 120 banks and financial institutions from 23 countries across Asia Pacific, Gulf and Central Asian regions. Punjab Youth Congress (PYC) president Ravneet Singh Bittu today charged the SAD-BJP government in Punjab with failure on all fronts, especially the financial mess prevailing in the state, which was the outcome of wrong and shortsighted policies. The District Congress Committee (Urban) performed a havan at a temple here today to seek God’s help in the release of 17 youths sentenced to death in Dubai. 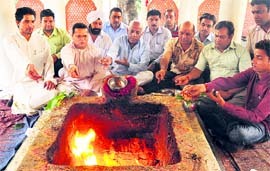 Led by DCC president Jagmohan Sharma, the leaders sat in the religious ceremony for two hours and prayed for the immediate release of the youths. Giving in to the protests by members of Mahila Congress in the city, the state leadership of the party today held back the appointment of Leena Taparia as president of the outfit. Sona Walia, a singer, released her second album “Kuri Punjaban” here today. Though she migrated to UK some 15 years ago, she is completely in love with Punjab and Punjabi. The CBI team, from Chandigarh, today raided the house of Ranjit Singh Brar, an income tax officer posted at Moga. Brar, in order to settle the case of a businessman, demanded Rs 50,000. Infuriated business man approached the Moga vigilance department, but they expressed their inability to act against the department governed by the Central government and advised him to approach the CBI. Residents of Himmat Singh Nagar today protested against the opening of a liquor vend in their area. Residents, including women in large numbers, opposed the opening of the vend, making people working at the vend site flee. The Pensioners Information Centre Management Committee has urged the state government to release installment of dearness relief of 8 per cent so as to raise the same for the present level of 27 to 35 per cent to all government pensioners and family pensioners with effect from January, 2010. The District Magistrate, Rahul Tewari, today banned the use of combine for harvesting of wheat from 7 pm to 8 am in the district. The order will remain in forced until May 31. Finally the Jagraon Bus terminal will be named after Shaheed Lala Lajpat Rai. Transport minister Master Mohan, when arrived at Jagraon to take part in the golden Jubilee celebration of LR DAV college on January 28, promised to name the bus stand after the name of Lala Ji. After completing the due formalities, the work on establishing a statue of Lala Lajpat Rai near the entrance of the bus stand, besides, renaming it, had started on March 10 with a set target to complete the construction work by April 10. The Dakha police has nabbed Harbans Singh, alias Kala of Pabbian village, with eight bottles of Rexcof, a habit forming cough syrup, and 200 grams of smack like substance yesterday. A case of tractor snatching was solved after four accused were arrested from Thakarwal village last night. The accused, identified as Gagagdeep Singh, Gurjinder Singh, alias Titu, Kulwinder Singh, alias Vicky and Kuljinder Singh, were held for forcibly taking away a tractor from Gurpreet Singh on April 3. Jugraj Singh, another accused, is still at large. 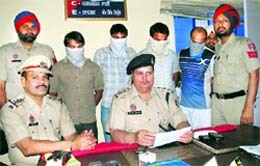 The Sidhwan Bet police yesterday booked a person for creating a fake agreement in his favour, along with two witnesses to the agreement. Surjit Singh, in his complaint to Ludhiana SSP Harinder Singh Chahal on December 29 last year, stated that Ravinder Singh of Nurpur Bet village, along with fellow villagers Jagroop Singh and Gulab Singh got a fake agreement of sale regarding 18 kanal 7 marle plot at Walipur Kalan in his favour. Dharminder Singh, alias Pinder (25), a carpenter, committed suicide by consuming some poisonous substance here yesterday. Dharminder had left the house on his motorcycle (PB-50-T-CA-0804) following a minor altercation with the family yesterday. His youngest brother was going to get married yesterday and, instead, of going with the marriage party, he went to some undisclosed location. A minor altercation among two groups turned into a fatal brawl that ended with the death of a policeman at Chowkiman village, near here, last night. During the last panchayat elections, the village witnessed a fierce contest between two groups, both belonging to the Akali party. With a week to go for the final of the ongoing first edition of the World Cup Kabaddi, which is slated to be held here on April 12, the venue, Guru Nanak Stadium, is being spruced up for the mega event.